Our AACTFest 2013 entry, "A Doll's House", will perform at the AACTFest on Saturday, March 23rd, 2013, at the Los Alamos Performing Arts Center in Los Alamos, NM. The Los Alamos Performing Arts Center is located at 1670 Nectar Street, Los Alamos, New Mexico. The performances on March 23rd start at 7 PM. In accordance with AACTFest rules, if you attend the performance you will see both shows that perform that evening (the theatre is closed once performances start, if you leave you cannot re-enter). For more information on the AACTFest as a whole, visit http://www.theatrenm.org (Theatre New Mexico, which runs the state AACTFest), http://www.lalt.org/AACTFest/index.shtml (Los Alamos Little Theatre, the 2013 host theatre), and http://www.aactfest.org (the national AACTFest site). 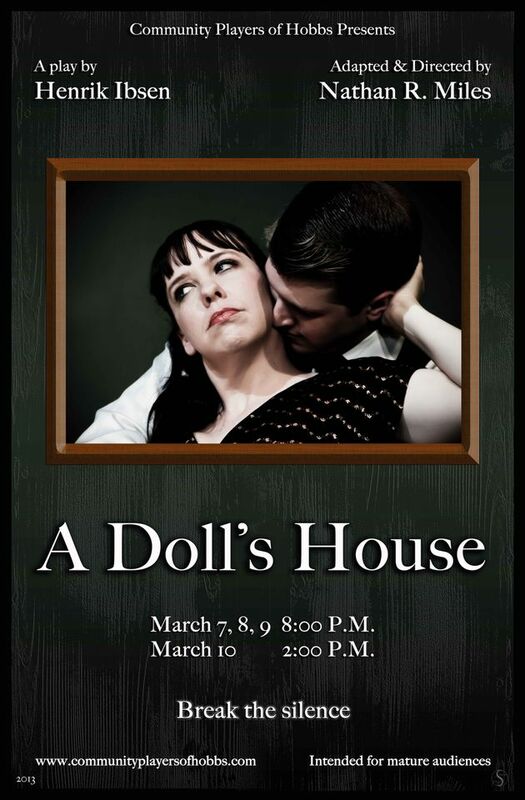 REMEMBER: Tickets are on sale for our local performances of "A Doll's House". Show dates are March 7th, 8th, 9th (8 PM), and 10th (2 PM). All seats are $10, and tickets may be bought online by clicking here (or the ticket icon on the left side of our website). The 2013 Season opens in 10 days! NMJC Theatre "Little Shop of Horrors"
"A Doll's House" tickets are on sale!